Manufacturer: Cellresearch Corporation Pte. 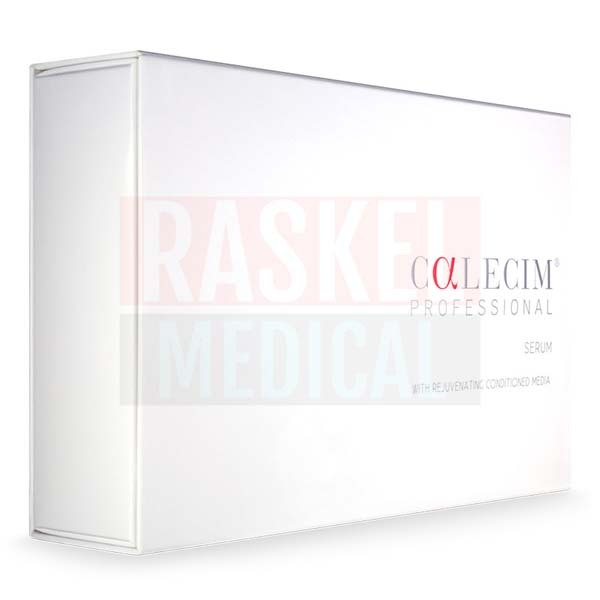 Ltd.
CALECIM Professional Serum is a skincare product designed to be used after in-clinic aesthetic treatments to alleviate post-procedure redness, swelling and other inflammatory reactions. The serum contains a proprietary mix of proteins, nutrients, and collagen to promote skin renewal and regeneration. With skin restored, a brighter, revitalized complexion is achieved. CALECIM Professional Serum contains the chemical signals that are involved in various aspects of cell proliferation and regeneration, to help with skin healing and prompt structural changes in the skin. As these chemicals were secreted naturally by stem cells, the mixture is physiologically balanced to provide the ideal environment for these components to work together optimally. Its ability to reduce inflammation and promote skin cell regeneration makes it the ideal post-procedure treatment, to help minimize downtime and enhance procedure results. The abrasive nature of skin rejuvenation procedures allow the serum to penetrate deep into the skin when applied right after the procedure, and its continued use in the ensuing days will further benefit the skin to attain optimal treatment results. 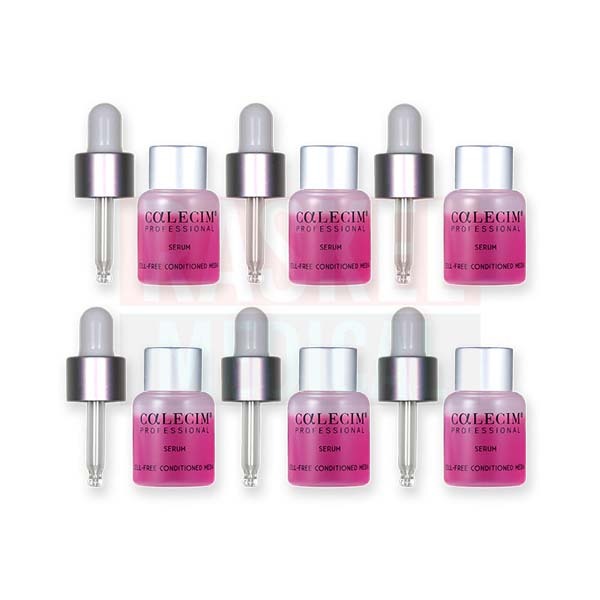 CALECIM Professional Serum is a product of Cellresearch Corporation Pte. Ltd., a Singaporean company. This product is made in Singapore. When it can cause side effects? CALECIM Professional Serum is to be used on unbroken, healthy skin. On occasion, use of this product may result in skin blemishes as part of the skin renewal process. Patients who have hypersensitivities, skin conditions, or other health issues that may affect their safe use of this product should consult their doctor before using the product. If the patient experiences any unintended effects, like rash, hives, or redness, they should immediately rinse the product off with water and discontinue further use. If their symptoms worsen or persist for a prolonged period of time, they should seek medical attention. This product is suitable for all skin types, and works to alleviate red, sensitize, traumatized or post-procedure skin. However, patients with active acne should consult a doctor before use to ascertain if this product is right for them. What it is made without? This product contains ingredients derived from neonatal mammalian stem cells; however, they do not contain any stem cells or cell particles. CALECIM Professional Serum is part of the CALECIM Professional series, a professional-grade skincare range that also includes Calecim Professional Restorative Hydration Cream and Calecim Professional Multi-Action Cream. CALECIM Professional Serum may be used as part of an in-clinic aesthetic treatment or for at-home maintenance. In-clinic application: After a skin rejuvenation procedure, such as a chemical peel, laser resurfacing treatment, radiofrequency therapy or microneedling, CALECIM Professional Serum may be applied to reduce any redness or swelling. If necessary, cleanse face thoroughly with water or a mild non-AHA cleanser. Apply the serum in sequence with the 4 facial aesthetic zones (forehead and nose; right and left side of the face around the eyes down the side of the nose and skirting the sides of the upper lip, mouth and chin; and the area around the upper and lower lips) for uniform coverage. Gently rub the product into the skin using small circular motions. Use all the contents in a vial. After cleansing the face with a non-AHA containing cleanser, pat skin dry with a clean towel. Application of toner may be skipped if it causes discomfort. Apply Calecim Professional Serum to the 4 facial aesthetic zones, extending onto the neck and decolletage if necessary. Ensure that the serum is applied all the way back to the skin in front of the ears and on the lower eyelids up to the eyelashes. Follow-up with application of a thin layer of corrective cream, like CALECIM Professional Multi-Action Cream, then with moisturizer (like CALECIM Professional Restorative Hydration Cream) if necessary, and sunblock after. CALECIM Professional Serum contains high concentrations of CALECIM Conditioned Media, which comprises stem cell-derived albumin, consolidated peptides or glycoproteins, fibronectin, soluble collagen, and hyaluronic acid. CALECIM Conditioned Media is obtained through the collection of media that was used to cultivate and culture non-human mammalian cord stem cells, which is then processed using advanced technology. This serum also contains a pH indicator, phenolsulfonphthalein, that turns the color of the solution light yellow/orange to light red/dark pink, indicating the product is within the acceptable range. 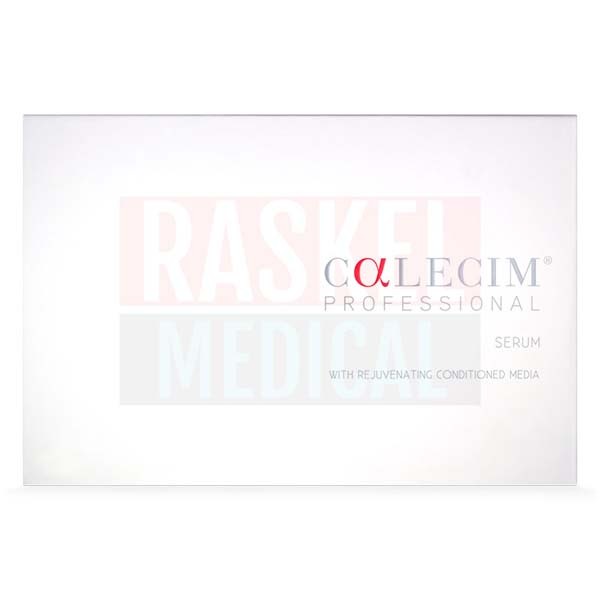 The results imparted by CALECIM Professional Serum are immediately noticeable, and long-term aesthetic effects can be gained with regular use. Store at room temperature, not exceeding 33°C. 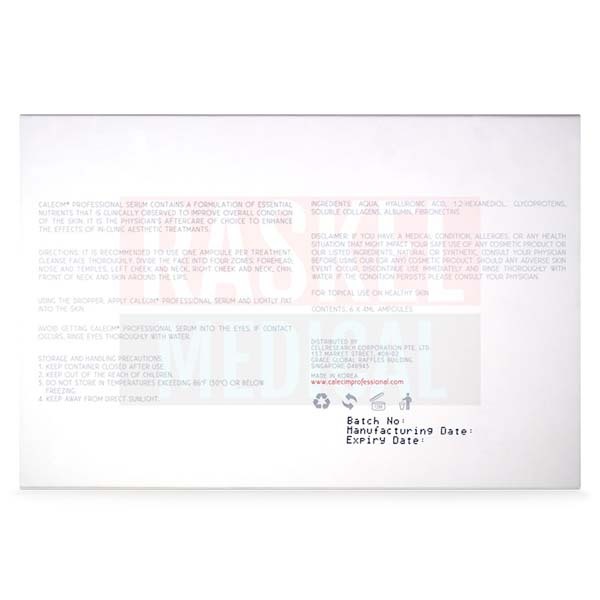 This serum is meant to be used within a few days after the in-clinic procedure.